Medical terminology can be hard for laypeople to understand. We can help you learn the language so you can communicate clearly with your child’s medical care team. No parent is prepared to hear that their child has a brain or spinal cord tumor. It’s important to recognize that nothing you did as a parent led to your child’s diagnosis. 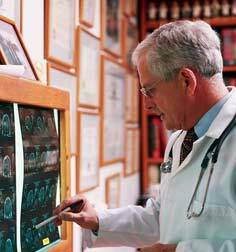 The specter of a brain tumor diagnosis can be overwhelming. All at once the triumphs and trials of everyday existence hold little importance. Learning more about your child’s tumor can empower you to move forward and take an active part in selecting which approaches will result in the best care for your child. Talking with your doctors and nurses will help them handle your concerns about your child’s health. One of the best ways to communicate with medical care team is to ask questions. Because time is often rushed during medical appointments, it’s helpful to prepare in advance questions you might want to ask about the diagnosis, treatment plan, hospital and more. If your family is facing a new diagnosis of a childhood brain or spinal cord tumor, the PBTF provides a toolkit designed to help you partner with your child’s healthcare team and organize medical information. The Starfolio is a binder filled with basic information on childhood brain tumors and templates and tools to track treatment and care. Call our Family Support team at 800-253-6530, x306 or email to order your free Starfolio.